Next Post > Top 13 Beauty Benefits Of Aloe Vera For Hair, Skin – How To Use? Ingrown hairs or razor bumps occur when a hair grows inwards and curls up instead of popping out. The red bumps caused due to ingrown hairs are often itchy and uncomfortable. 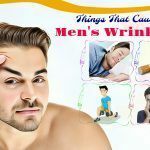 Men often suffer from an ingrown hair on neck, cheeks, & chin after shaving while women suffer from it on armpits, legs, and public areas. An ingrown hair is followed by an infection leading to redness, swelling, as well as irritation resembling a pimple. Improper shaving methods and excessive hair growth are the main causes of ingrown hairs. Removing aggressive and improper hair by waxing also causes ingrown hairs. Thankfully, there is a variety of natural home remedies for ingrown hairs removal. These methods are very effective and decrease the inflammation rapidly. They also accelerate the healing process and don’t have any side effect. You can apply them to the public parts of the body. Let Beauty Talk shows you how to get rid of ingrown hairs naturally & fast. The first step is taking the olive oil and adding the tea tree oil to this. The next step is mixing the solution well and applying on your affected parts. Gently massage with the aid of the fingertips for five minutes after 10 minutes or more, you wash affected area by using lukewarm water. It’s a great idea to reapply twice each day to eliminate ingrown hairs on the leg, face and neck. “A hair in the head is worth two in the brush” – William Hazlitt. 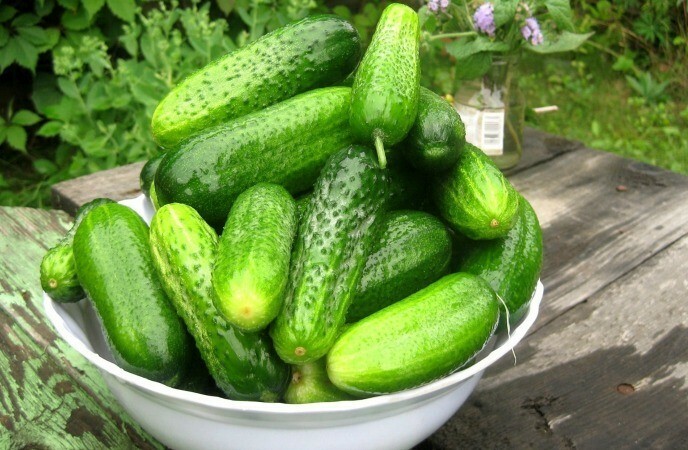 The potent remedies on how to get rid of ingrown hair naturally must include cucumber. Basically, cucumbers have anti-inflammatory & hydrating abilities that effectively soothe the irritating symptoms caused by an ingrown hair. Furthermore, cucumbers are able to relieve itchiness along with pain caused due to this condition since it packs vitamins C.
Take 1 cucumber first and then slice it. Now put these fresh cucumber slices in your refrigerator for about thirty minutes. After this, you rub on the affected area with the chilled cucumber slices. To get visible results, do this several times each day for several days. Make a puree of ½ a cucumber first and then mix in 1/3 cup of milk. After that, put this mixture in your refrigerator for several minutes until this is cold. Now soak a cloth in the prepared mixture and apply to your irritated area for some minutes. Finally, rinse this mixture off with lukewarm water. To improve the condition sooner, follow this home remedy 2 times each day for several days. Firstly, you soak the aspirin tablets in the warm water to have a paste-like consistency. To this paste, add the prepared honey and now apply this prepared paste to the affected part. Leave your application on for ten minutes and wash off by using with warm water. Afterward, you gently pat your skin dry. Try following this home treatment frequently for removing ingrown hairs. At first, take the prepared sugar in a bowl and add the tea tree oil along with olive oil in it. 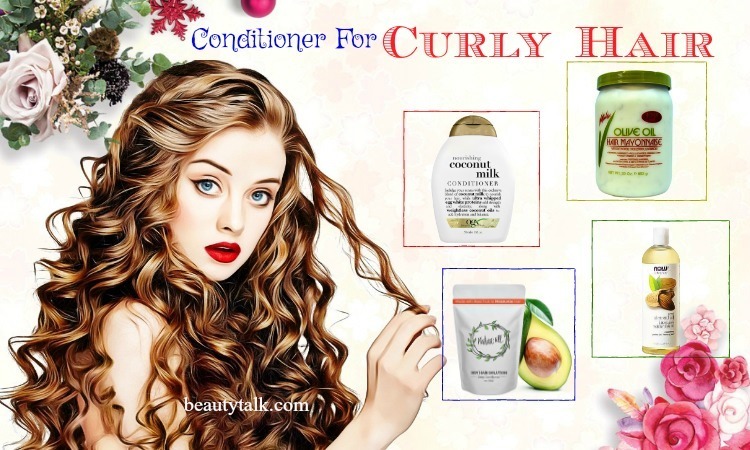 Later mix all these items well and now apply the resultant scrub to the affected part. Gently rub it and scrub for around three minutes moving the tips of your fingers in a circular motion. Thereafter, you need to use enough warm water to wash the area. It’s advised to use the remedy twice each week to eliminate ingrown hairs in a natural way. Clove in this scrub comes with anti-inflammatory, antibacterial and antiviral features that can lower the redness caused due to ingrown hairs. Take the brown sugar at first and later add the clove essential oil to it. To this mixture, add some almond or jojoba oil and now scrub the skin with the resulting mixture. Finally, use lukewarm water to rinse the skin prior to you towel dry it. Mix well the salt in the warm water at first. Then gently stir it and allow the salt to dissolve in the water. Thereafter, take the cotton balls and soak in this solution for around one minute. Presently, use the cotton balls to apply the resulting solution on your affected area and rub the solution lightly over the ingrown hairs. After about 2 minutes, use the wet warm cloth to wipe the area. You easily remove ingrown hairs by repeating the remedy twice each day. Aloe vera contains many benefits to skin, health, and hair and has multiple uses to treat many health problems. 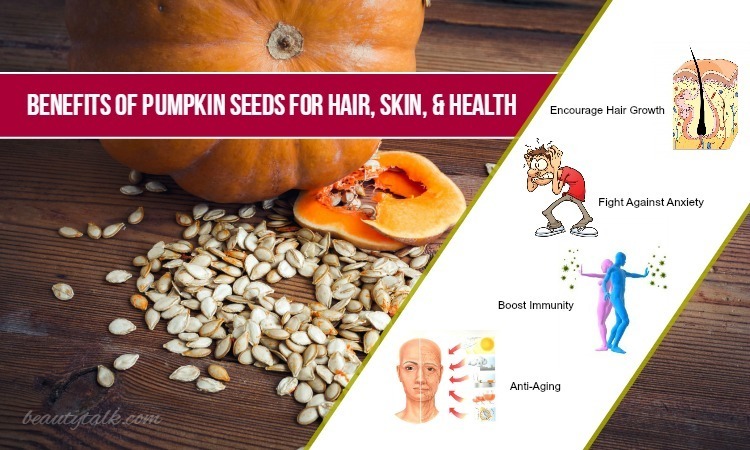 It’s also rich in nutrients and fiber. 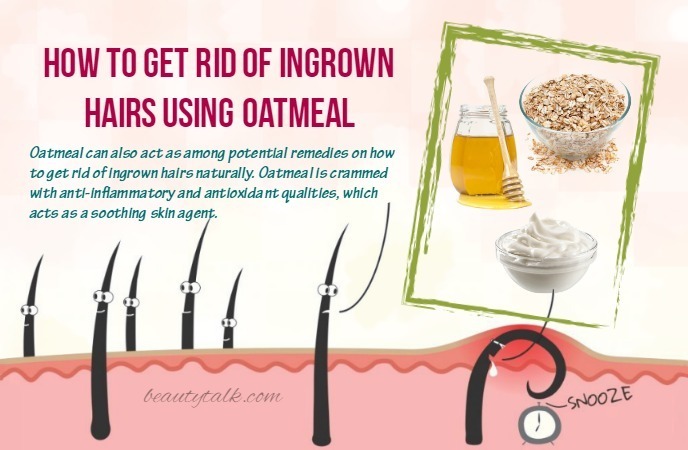 Are you wondering how to get rid of ingrown hairs naturally? Then opt for aloe vera mask instantly. Aloe vera also comes with the cooling & soothing nature that provides fast relief from inflammation and itchiness associated with ingrown hairs. 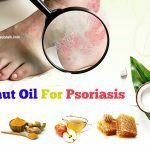 Apart from that, it has the capacity to encourage the healing procedure and protect the skin from any infection. Use the following steps below to get instant relief from ingrown hairs. For this remedy, you take the prepared aloe vera gel and add the honey in it. Later mix these well to have a uniform paste and afterward, apply on the affected part by using the paste. Keep your application for 15 minutes before removing using warm water. To combat ingrown hairs quickly, repeat this natural treatment 2 times weekly. 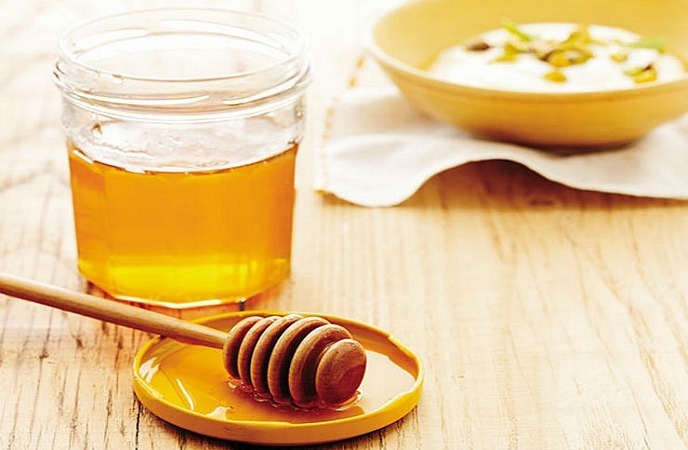 First of all, take the honey (2 tbsp) in 1 small bowl and later add lemon juice (a tbsp) in it. You need to combine these things well to obtain a smooth paste. Now apply that paste on your infected area and wait for fifteen minutes or more before washing with cold water. You can easily remove ingrown hairs by following the remedy twice in one week. 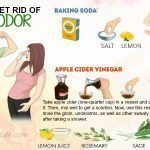 Firstly, dilute the ACV with the water and later soak the prepared cotton balls in the resulting solution for about two minutes. After this, use the cotton balls to dab on affected area. After five minutes, you remove the cotton balls & wash your area using lukewarm water. The ingrown hairs will be removed soon by repeating the remedy two times each day. The initial step is adding one cup of water in one tablespoon of baking soda. Mix them well to attain a uniform solution and afterward, soak the prepared cotton balls in that solution for 1 or 2 minutes. Now dab these cotton balls on your affected areas and wash your skin with warm water after keeping for 5 minutes. To fight against ingrown hairs on face and legs, use the remedy twice in a day. 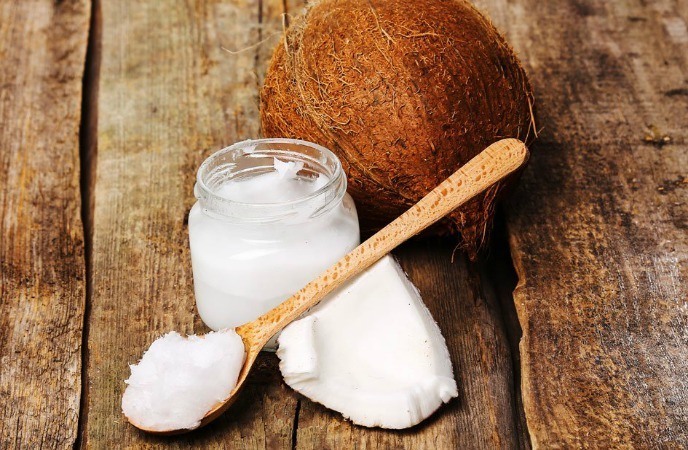 Coconut oil can moisturize the skin well and provide nourishment to it. 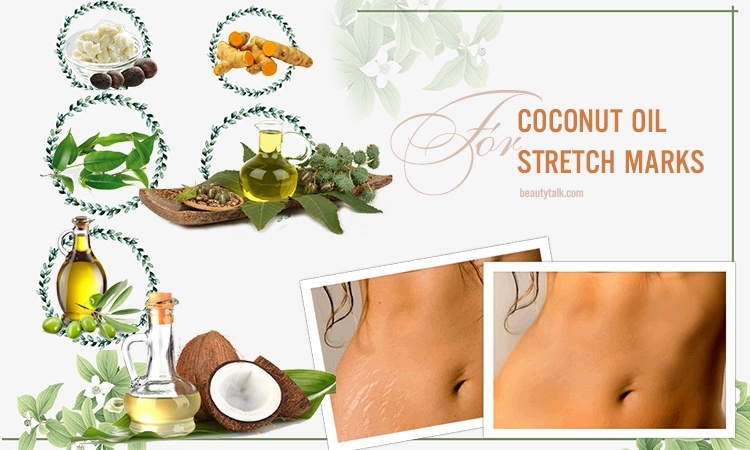 It can remove ingrown hairs since it packs antibacterial & antifungal qualities. Furthermore, it helps to balance the skin’s pH levels. 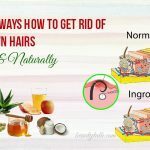 Are you wondering how to get rid of ingrown hairs naturally? Then coconut oil is the ideal remedy for you. Firstly, you take the prepared coconut oil in 1 small bowl and heat up the oil for a while till a liquid of the oil is formed. 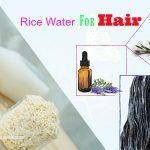 To the liquid, add the tea tree oil and afterward, apply & massage this mixture on the skin after shaving the hair. 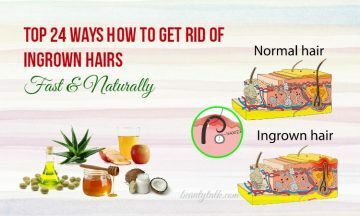 Your ingrown hairs will be eliminated gently by using this remedy regularly after shaving process or every hair removal. The list of the natural methods on how to get rid of ingrown hairs is incomplete without consisting of coffee remedy. Thanks to its acidic properties, coffee exposes the trapped hair and keeps the skin free from infection. 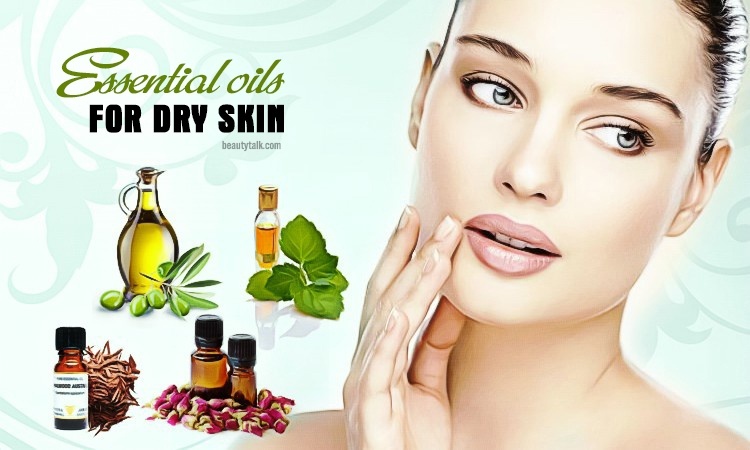 Moreover, it aids in making the skin pores clear and clean. The hair will grow back in the proper direction with the aid of the acidic properties of the coffee. Take the coffee powder first and then add the olive oil along with warm water to it. Now you need to mix these ingredients well to achieve a smooth paste. Use this paste to massage the affected region for 2 minutes. Lastly, use enough warm water to wash the skin carefully. Repeat the remedy 2 times weekly to naturally remove ingrown hairs. After shaving, you dip 1 cotton ball in some witch hazel and later swipe the entire area with the cotton ball. It’s not necessary to wash off that witch hazel. Do this process every time you shave. First of all, you have to extract juice from one lemon. Then, directly apply this lemon juice on the affected regions and keep it to dry totally. Lastly, use enough lukewarm water to wash it off and pat dry. The simple procedure can be repeated regularly. Firstly, you mix ground oatmeal, yogurt together with honey in equal amounts. Next, rub the resultant mixture over your irritated areas and after thirty minutes, rinse this mixture off with cold water. Follow frequently for best effects. Firstly, slather some castor oil on your affected areas and keep this on for 10 to 15 minutes. Then, take 1 washcloth and soak it in warm water. Now wring out the excess and wipe off the application with the wet washcloth. To naturally and rapidly get rid of ingrown hairs, repeat the easy process 2 or 3 times each day. Prepare a paste by combing together cornstarch and water. Next, spread on your infected parts with the paste and leave your application to dry completely. Gently peel the application and rinse with water. The process can be repeated frequently until the ingrown hairs are removed totally. Potatoes can aid in soothing the inflammation resulting from the ingrown hairs because it has high amounts of antioxidants. It also reduces the redness and itching caused by ingrown hairs. Particularly, the starch found in the potato will aid in drawing out the hair and protecting the dermis when the hair has been eliminated. It also enhances skin regeneration, moisturizes and soothes the area, thereby preventing ingrown hair scars. Peel one potato at first and then place the inner side of the potato on your infected parts. With the aid of a bandage or gauze, secure the peel and keep it on for a day. Remove the peel afterward and now replace it with a new one. To get visible effects, repeat the process daily. 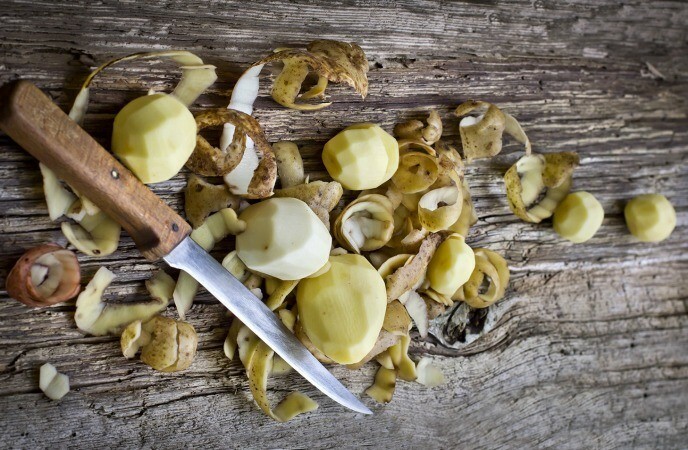 Brush 1 to 2 garlic cloves to attain a paste at first and apply the resulting garlic paste on your affected areas. Keep your application on for 20 to 30 minutes and lastly, rinse with warm water. In order to remove ingrown hairs faster, repeat the process every day. Firstly, take membrane out of inside an eggshell and later apply it carefully on the problem area. Now leave your application to dry for several minutes and afterward, shrink around the area. Pull it off once dry and the ingrown will be removed significantly. Take few strawberries at first and crush them afterward. Now add a little of sour cream and combine well. Thereafter, apply this combination over the affected areas and after twenty minutes, rinse with cold water. This process can be followed regularly. 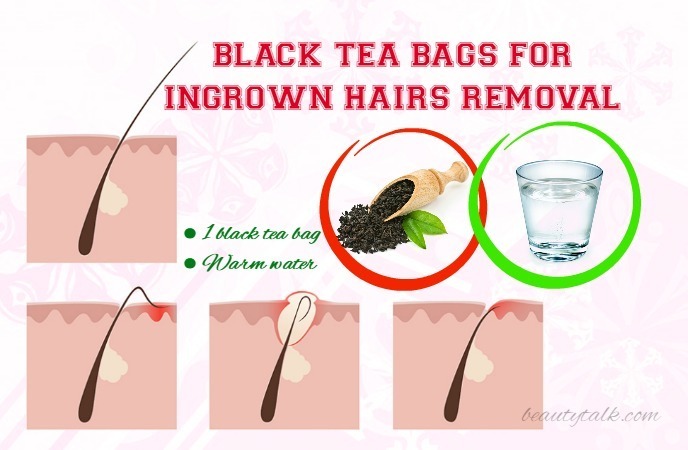 This is also among the best remedies on how to get rid of ingrown hairs because the black tea packs tannic acid, which lowers inflammation & redness and helps to soothe the skin altogether. In addition, the black tea is able to ease redness, itching and inflammation owing to its tannic acid. Take a black tea bag first and then moisten it in warm water. Then, rub it over your infected area for around 2-3 minutes. You can repeat the procedure several times every day as needed. Take a black tea bag first and then steep it in hot water for several minutes. Remove the tea bag from the water afterward and now squeeze out the resulting liquid into a bowl. You mix the liquid in 1 tsp of coconut water. Immerse a cotton ball in this mixture and gently press it on the irritated skin. It is recommended to do this twice every day for several days until you notice an improvement. You should wash the affected area every day with lukewarm water & antibacterial soap as well because this aids in preventing bacterial growth. Before shaving, exfoliate the skin carefully since this prevents razor bumps or ingrown hairs. Instead of shaving, women can choose waxing. Instead of multiple blades, opt for using the razor with a single blade because this prevents razor bumps. Avoid using old blades and razors for shaving. You can apply antiseptic creams on your affected areas because they help to prevent the infection. Exfoliate & moisturize the areas frequently to remove unwanted hairs. Avoid shaving for at least four weeks after eliminating the ingrown hair. 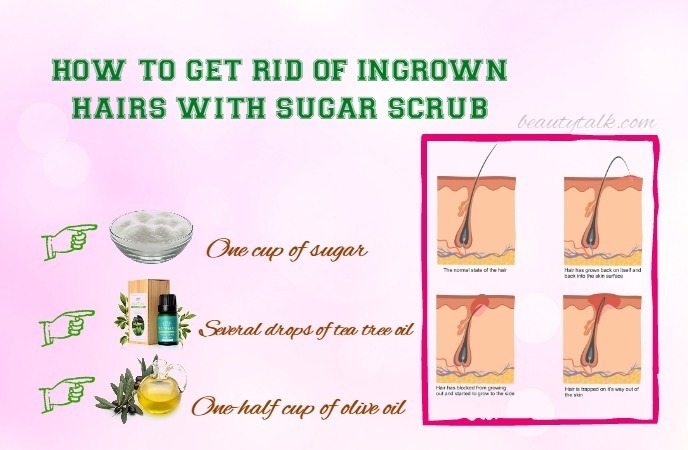 So, now are you wondering how to get rid of ingrown hairs naturally? Just use these home remedies & tips and remove the ingrown hairs rapidly. They will help you to prevent the problem of ingrown hairs. 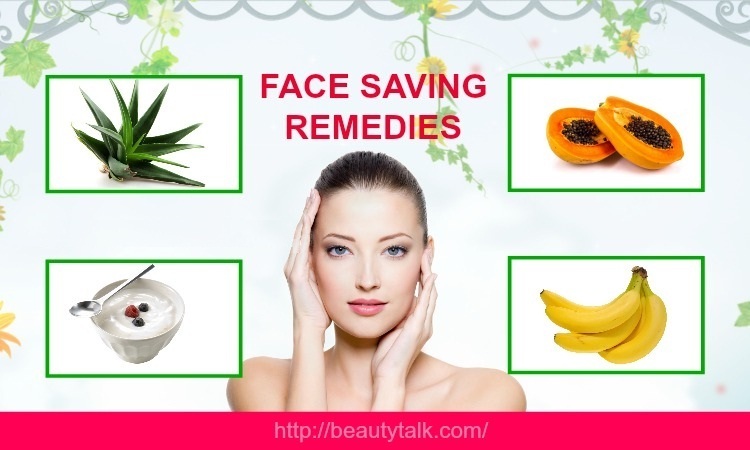 After trying out these remedies and tips, if your condition still persists, then consult a dermatologist. 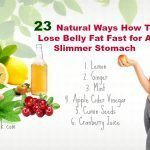 You can also read more our informative posts by visiting our main Health page. Did you find our post helpful? Do you know any other remedies on how to get rid of ingrown hairs? Share it with us by leaving your comments in the box below.